The Idaho Wool Growers Association and Shirts Brothers Sheep are suing the Idaho Fish and Game Department over an agreement that they signed in 1997 which would hold woolgrowers harmless if bighorn sheep introductions caused harm to their business. There are a number of problems with the agreement which make it unenforceable. I don’t know how the IDFG could block the Forest Service from making these changes. The IDFG has no control over the actions of the Forest Service. The IDFG does not manage grazing privileges on the National Forests and even if the lawsuit is successful it will not change the obligations of the Payette National Forest under the National Forest Management Act which requires them to manage the Forest in a manner which maintains the viability of native or desirable species, including bighorn sheep which have declined in number to only 3500 statewide. 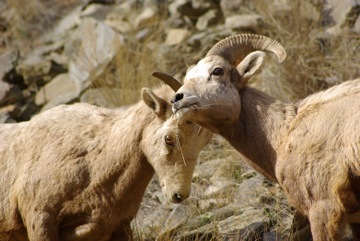 In response to litigation by Western Watersheds Project, the Payette National Forest is drafting a Supplemental Environmental Impact Statement which proposes an alternative which may close up to 60% of the Forest’s sheep grazing allotments to keep domestic sheep separate from bighorn sheep that inhabit Hell’s Canyon and the Salmon River Canyon. Domestic sheep are known to carry diseases which are deadly to bighorn sheep and are likely to have killed hundreds of bighorn sheep throughout the west this winter.